Arran 14 was the first whisky that sent me into "whisky euphoria." Before this, I knew I liked whisky, and had enjoyed the likes of HP12, Glenlivet 12, and Ardbeg 10. But this Arran, it made me say "whoa, this is heavenly and I'm about to begin a passionate new journey with this thing called whisky." This was my first Connosr review, and as a whisky noob I definitely got carried away with my scoring, or so I think I did. We'll find out when i start examining this dram in depth. I have now returned a few years and many wonderful whisky experiences later to see if this Arran continues to amaze me like it did before. Bottle has been opened 2 weeks and is just over half full (yes it's going to go fast. Hopefully i can restrain myself for a few months to see what air does to it.) Neat in a glencairn, it has been sitting patiently for half an hour. No water. Nose: Definitely get more of the sherry cask over the bourbon cask in the nose. Candied cherries, marzipan, chocolate, orange peel, and creamy apricot jam. Citrus fruits without the acidity. The longer I nose this, more and more vanilla comes out. Vanilla ice cream with apricot, peach and orange peel. What is really interesting though is a small whiff of smoked salmon grilled on a wooden plank. Interesting layer to a predominantly fruity, vanilla nose. Palate: Very creamy texture. Loads of apricot, candied cherry, marzipan and vanilla, with some sherry and grapes coming later, followed along with some lemon juice on grilled tilapia. The nose had more sherry cask notes, palate seems to have more bourbon cask notes with all that vanilla. I appreciate how both bourbon and sherry casks work together without overpowering each other yet both distinctly present. Finish: Vanilla ice cream, followed by creamy smoke. Nothing like medicinal, iodine smoke like from Laphroig. This is a creamy, vanilla smoke. It reminds me very much of a mild, vanilla flavoured Acid or Tatiana cigar. Overall: Still a top 3 whisky for me! This will always have a permanent place on the shelf. Nice to hear it still meets your expectations. Nice review - though I had to google tilapia ha ha. I've only had the 10 (which I bought at a bargain price) and I've enjoyed it very much. I'll look to trying the 14 soon. Thanks. @Hewie thanks, yes I'm sure anyone who enjoys whisky will at least enjoy this even if they don't love it like I do. I always say tilapia is a "value fish" when you don't want to spend a fortune on fresh tuna or salmon. I recently bought a bottle of this after it had been absent from local shelves for close to a year. It did not disappoint, the bottle disappeared in a flash I barely managed to save a sample for future review. What a splendid whisky, creamy, aromatic with that trademark salty tang, I did find it a tad sharper than before but that's just picking nits.Great observation on the more the sherry being more present on the nose than palate. @cricklewood yes this bottle is going way too fast. Luckily I have a local shop that keeps it stocked year round. @casualtorture, thank you for your wonderful, lovingly executed review. 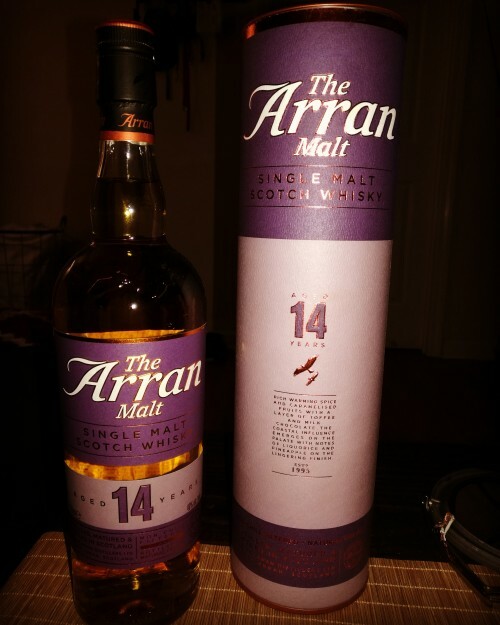 I am as much a fan of Isle of Arran 14 yo as you are. What I have had of it has been quite delicious. I am not a fan of standard Arran 10 yo. I find it rough and uncouth. 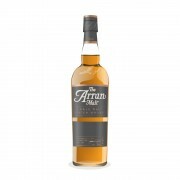 All I taste in Arran 10 is barley grain the quality and flavours of which I do not like. I do like most of the wine-finished riffs on the 10 yo quite a lot, though, especially Arran Sauternes Finish and Amarone Finish. They massively change the flavour profiles away from that of the basic 10 yo. For my palate I cannot think of an intermediately aged Scottish malt for which 4 additional years of aging makes more difference than it does with Arran 14 yo vs Arran 10 yo. @Hewie, I would be very interested in hearing your observations and comparisons once you have also tried some Isle of Arran 14 yo. I am glad to hear that you like your bottle of the 10 yo. Better you than me. I never criticize others for liking something which I am unable to like. Heck, I like a broader range of whiskies than probably anybody I know. I take pleasure in a few bottles which many would shun. @Victor I had a bottle of the 10yo, it was fine but fairly forgettable. Yes those 4 extra years in the sherry and bourbon casks seem to do wonders. @Victor Indeed it's interesting how 4 years and a slightly different barrel selection (I believe the 10 is mostly bourbon with just a touch of refill sherry) makes such a difference. I kind of enjoy the sprightly malty nature of the 10 but I can see that it would not please everyone. I have to say though if you haven't tried it in some years that the quality has improved quite a bit. 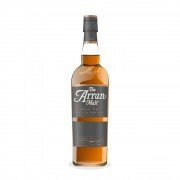 @cricklewood, that is an interesting observation that you make that you have found the Arran 10 yo to have improved in recent years. I am always interested in tasting the latest iterations of just about every whisk(e)y available because they do indeed often change. My last taste of Arran 10 yo was about 5 years ago. When I didn't care for the whisky the first time my follow-up tastes are going to have to come from samples from friends' bottles or from free or included-in-a-bigger-package paid commercial tastings. I will not be buying a bottle. Sure, I'd love to taste some Arran 10 that I will like. 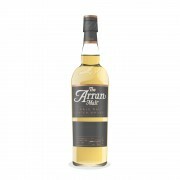 But even given the opportunity to buy some Arran 10 from a batch I like I am still much more likely to go for the gold standard, Arran 14. If you are rating the Arran 14 Year Old as a '95', I better open my Arran 18 Year Old to see what I think. Wow... so from all the whiskies that you have reviewed (which I suppose is not the same as you have sampled), this is the BEST whisky of all of them? @RikS I think I gave Glenfarclas 15 a 96. But this is definitely up there. I think I rated this 89 but it could (should?) easily have been a 90 pointer for me - perhaps my general lean towards 'heavier' malts swayed me a tad? Either way, it's a great whisky and one that is definitely on my re-purchase list and would recommend in a heartbeat. I like how you mention the salmon alongside the fruityness. I'm not sure I'd have said salmon but there's definitely a slight musty/funky/salty edge to it which sits beautifully with the full fruit (apricot- definitely) and soft spicy nature of it. @Hewie - If you liked the 10 then I think you'd love the 14! @cricklewood - I also liked the 10 more than most seem to. One that is under the radar a tad but would give the likes of Glenfiddich and Glenmorangie a bit of a bloody nose (in my humble opinion of course). @RianC, yes the 10 is not to everyone's liking but it has a lot of character, albeit still showing some rough edges of youth. The nose shows some of the characteristics that will come to fruition in the 14. Makes me want to try it again.